If you have seen the Western District Families Pioneer Obituary Index, you’ll notice pioneers have links to their relatives. I will be busy linking this month as six of the fourteen pioneers are related to earlier pioneers. There is also Walter Henty, father of one of the men featured in Hamilton’s WW1 Edward Ellis Henty. And William Chadderton who was practically a neighbour of Walter Henty. There is a link between two of the pioneers, Hamilton’s David Laidlaw and Garvoc’s John Scullion by way of the Hamilton home St Ronans. Interesting too is the story of William Doig’s will, giving us an insight into anti-German sentiment during WW1. Any underlined text in the post is a link to further information about the subject. 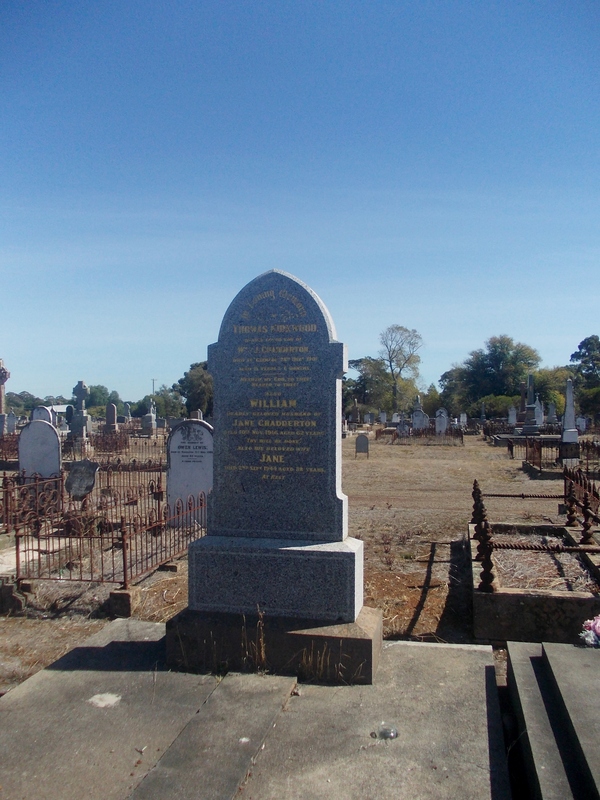 Harry NORTHCOTT – Died 5 November 1894 at Merino. Harry Northcott was born in Plymouth, England in 1853 and arrived in Victoria with his parents two years later. 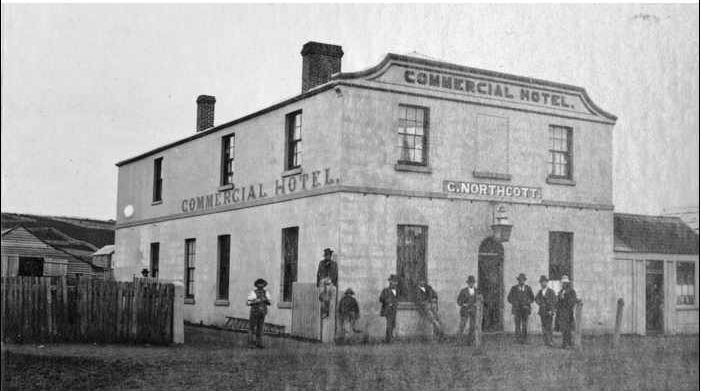 They settled at Merino and his father, George Northcott was a builder in the town and later operated the Commercial Hotel (below). Harry was apprenticed to his father as a joiner and remained working with him until 1879 when Harry married Alice Leake. 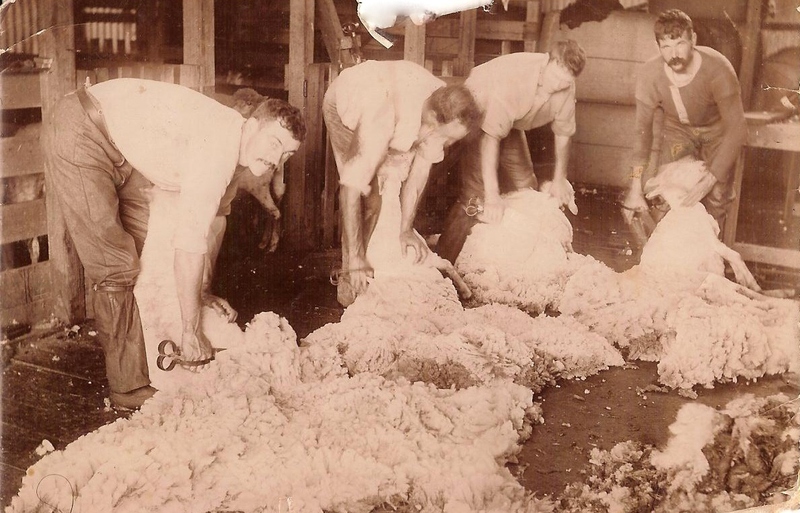 He then turned to work on the land having purchased several hundred acres on the edge of Merino. In 1891, Harry took over the running of the Commercial Hotel from his father. 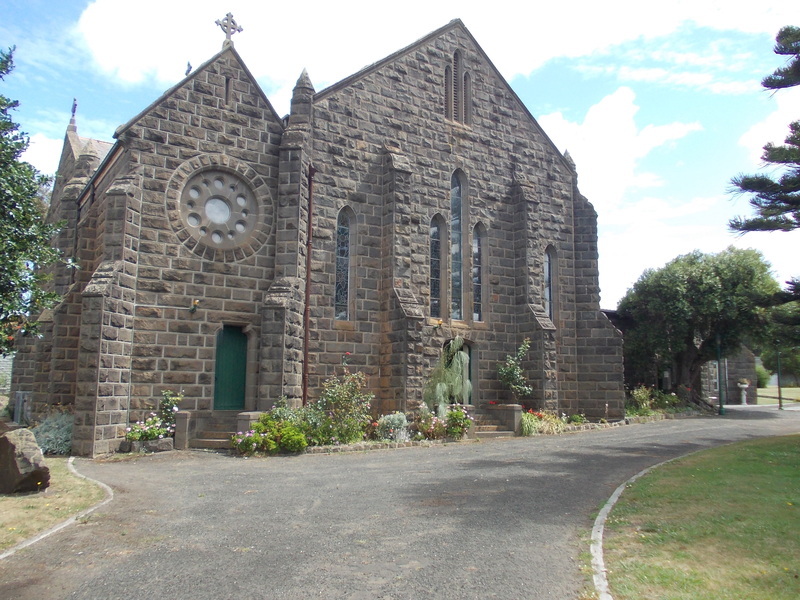 Harry was involved with the Mechanics Institute, a Shire Councillor and was a Freemason. He also enjoyed football, horse racing, and cricket. On 23 July 1894, Harry’s father died. Harry himself had suffered an illness at the time and died only three months after his father. 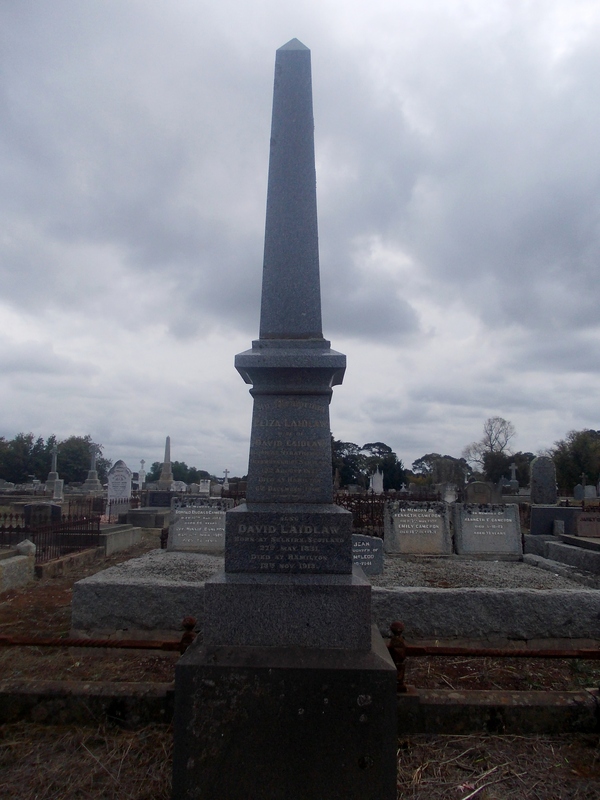 David LAIDLAW – Died 22 November 1913 at Hamilton. David Laidlaw was born at Selkirk, Scotland in 1831, a son of William and Agnes Laidlaw. The Laidlaw family arrived at Melbourne aboard the Argyle in March 1841. David attended the Scots School in Collins Street Melbourne then went to the property of his older brother Robert at Heidelberg where he learnt all things pastoral. 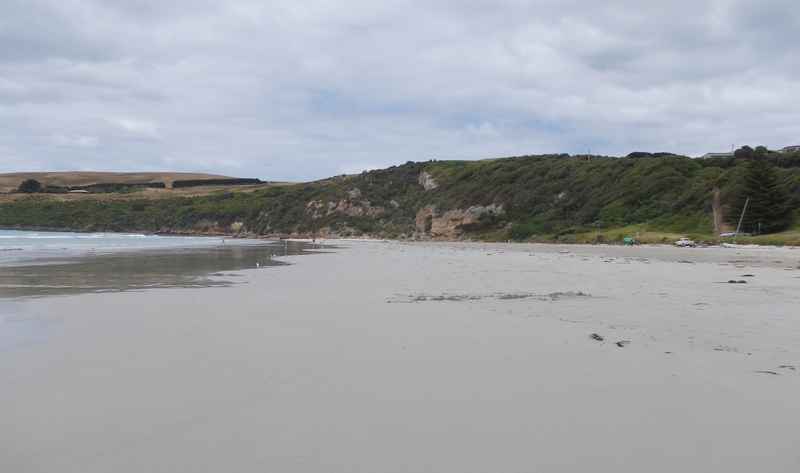 He then moved to Port Fairy where his parents resided and continued farming. It was around that time David gained a reputation as one of the best riders of buckjumpers around. In 1854, David married Elisa Fraser a daughter of John Fraser of Mount Sturgeon Plains Station, east of Hamilton. Their first child Edith was born in Port Fairy in 1856. Another daughter, Florence was born in 1858 at Port Fairy before David and Elisa moved to Hamilton with Margaret born in 1859. The family grew with a further seven children born over the next thirteen years. 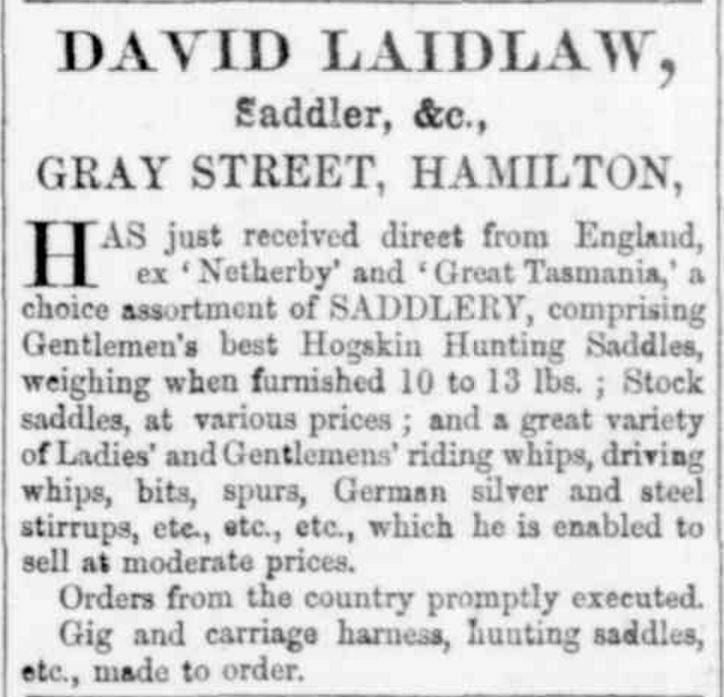 Soon after his arrival in Hamilton, David started a saddlery business in Gray Street. “Advertising” Hamilton Spectator and Grange District Advertiser (South Melbourne, Vic. : 1860 – 1870) 9 November 1861: 3. Web. 12 Nov 2016 <http://nla.gov.au/nla.news-article194859603&gt;. 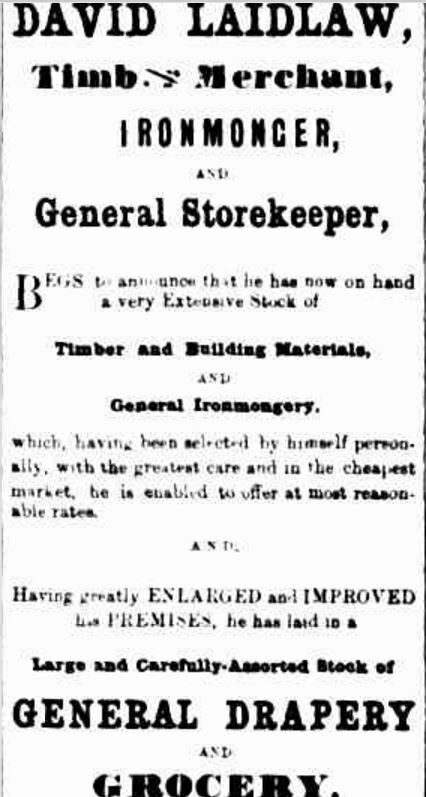 In 1866, David sold the business and in November 1867, took over the ironmongery business of James Allan in Gray Street. 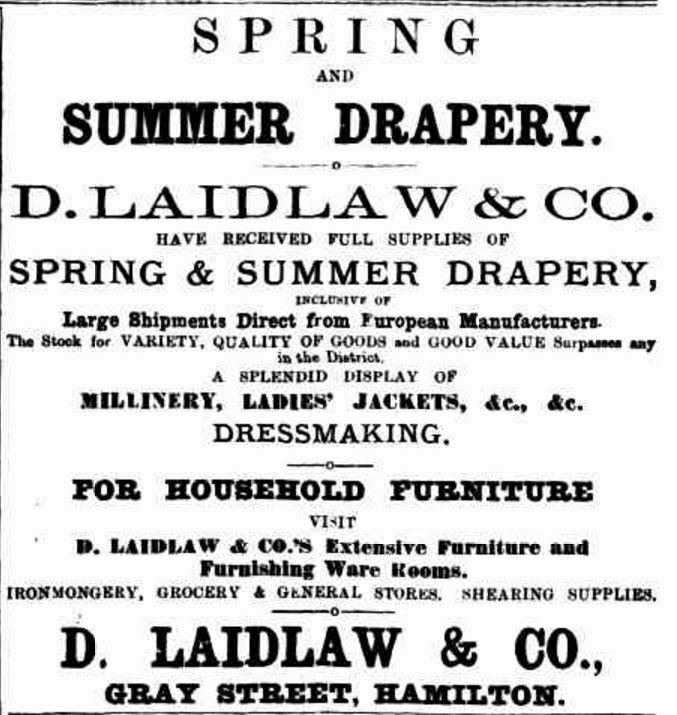 By the end of 1869, David had expanded the business to include drapery and groceries. 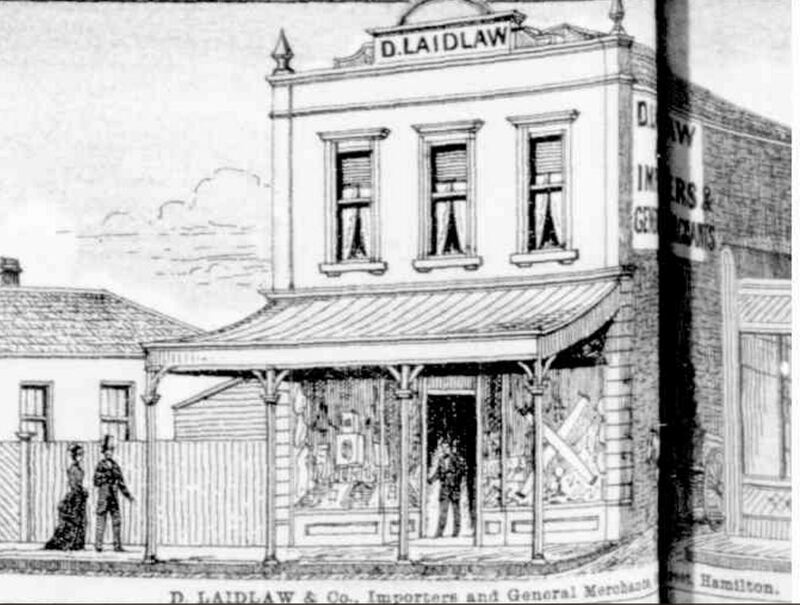 In September 1875, David entered into a partnership with Thomas Pratt and the business started trading as D.Laidlaw & Co. 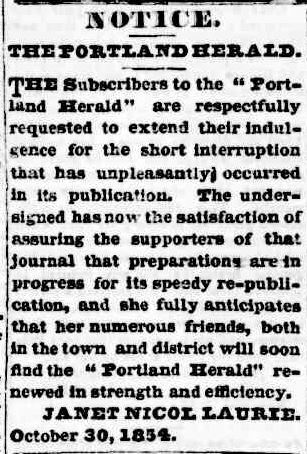 The partnership continued until 1881 when it was dissolved. David remained in the business. “Advertising” Hamilton Spectator (Vic. : 1870 – 1918) 13 January 1891: 3. Web. 12 Nov 2016 <http://nla.gov.au/nla.news-article226083364&gt;. 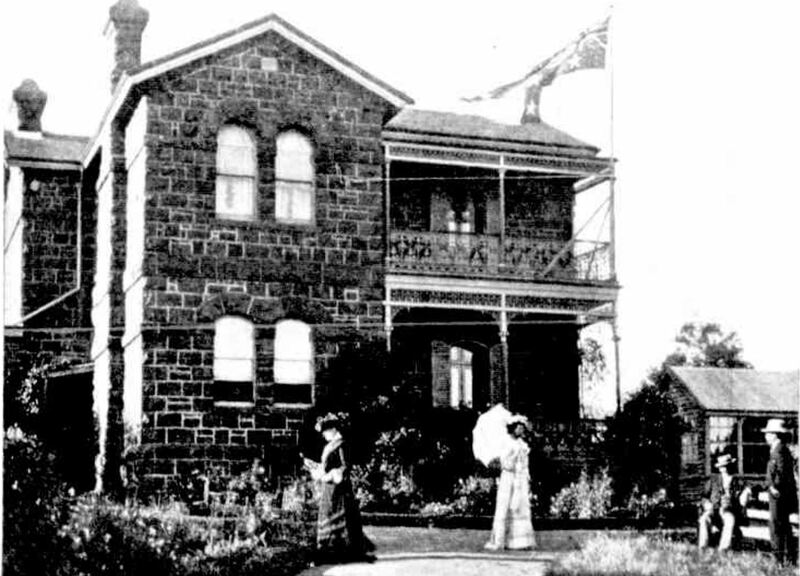 By 1890, David and his family were occupying St Ronans, a large bluestone home in Dryden Street Hamilton previously owned by draper Sigismund Jacoby and built with the stone of Hamilton’s first post office. The photo below shows St Ronans while the Laidlaws were in residence. From the time David Laidlaw arrived in Hamilton, he had an interest in the future development of the town. As a result, he was one of the founders of the Mechanics Institute, the Hamilton Hospital, the Hamilton and Western District College and the Alexandra College. 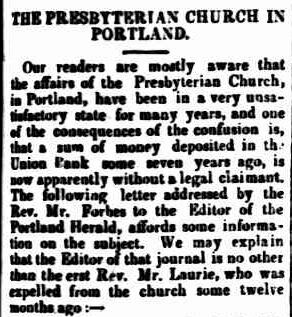 A Presbyterian, David was an elder of the Hamilton Presbyterian Church from 1861. He also served on the Hamilton Borough Council, first in 1861 and later as Mayor in 1871, 1888, 1892 and 1893. With his role on council, he was part of the committee for the building of Hamilton’s first Town Hall and was there when Mayor James Wiggens laid the foundation stone in 1872. He was also a Justice of the Peace and a member of the Caledonian Society. David Laidlaw’s contribution to Hamilton are still present today as the photos below show and a street was also named in his honour. David’s wife Elisa died in December 1906. David soon spent more time at home and indulged in his great passion for Scottish literature right up until his death on 22 November 1913, taking solace in the great works. He was eighty-two. On the day of David Laidlaw’s funeral, the bells of St Andrew’s Presbyterian rang out across Hamilton as the townspeople made their way to Church Hill to pay their last respects to a man who had done much for their town. Appropriately, the Hamilton Scottish Pipe Band accompanied David to his final resting place at the Old Hamilton Cemetery. 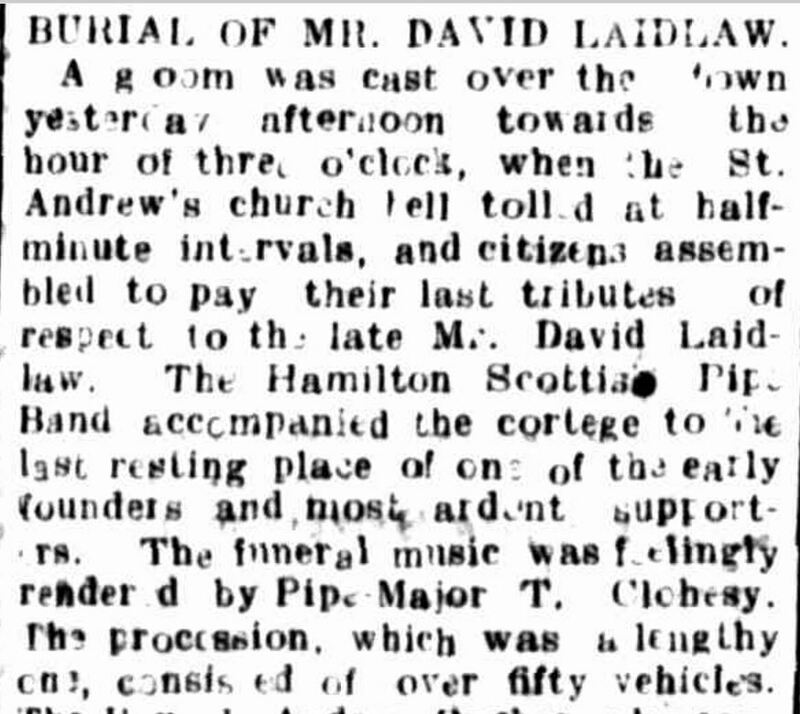 “BURIAL OF MR. DAVID LAIDLAW.” Hamilton Spectator (Vic. : 1870 – 1918) 21 November 1913: http://nla.gov.au/nla.news-article225165507 . 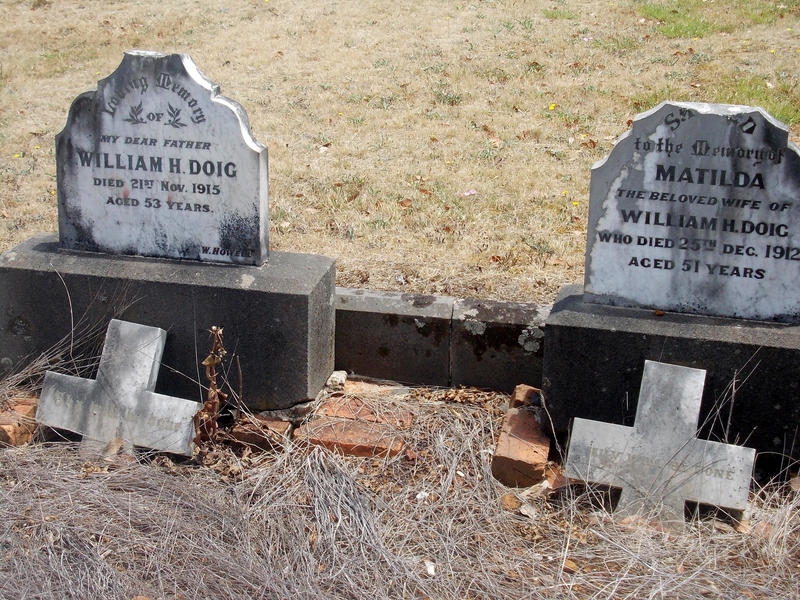 William Henry DOIG – Died 21 November 1915 at Hamilton. William Doig was born in Hamilton in 1863. He worked in the building and carpentry trade and built many residences in the town. In 1885, William married Matilda Graves. Matilda died in 1912 and William went to live with his newly married daughter Alexandra in Dinwoodie Street Hamilton. It was where he died in 1915. William’s death came over a year after the beginning of WW1 and a newspaper report about his will brings a twist to William’s tale, but indicative of the times. “A HAMILTON WILL” Hamilton Spectator (Vic. : 1870 – 1918) 22 November 1916: 4. Web. 12 Nov 2016 <http://nla.gov.au/nla.news-article129390444&gt;. Williams daughter Alexandra Mary Doig married Eric Gramsch in 1914, the year WW1 started but before the rise of anti-German sentiment in the community. Eric was born in Berlin and arrived in Australia in 1912. Since William was living with Alexandra and Eric, it may have been an uncomfortable arrangement with William’s strong feelings. The court case made news nationally with the Chronicle in Adelaide running the headline “Married a German” in the 25 November 1915 edition. 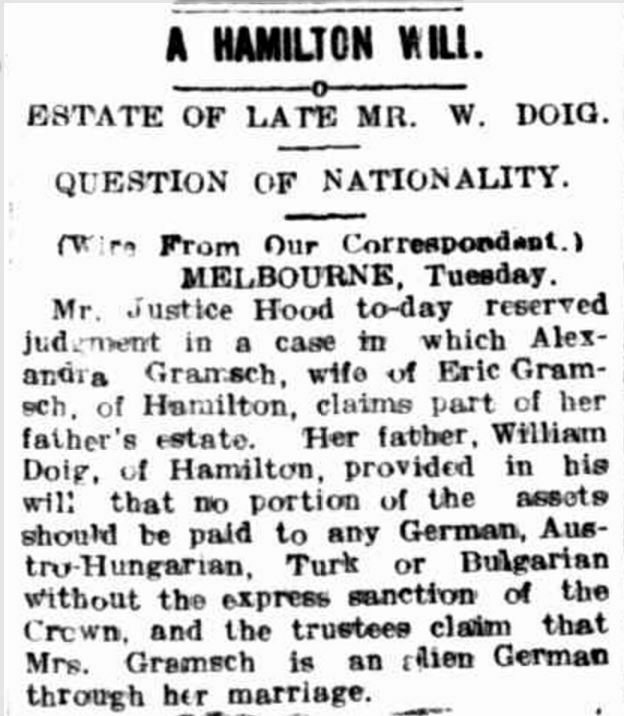 The judge did find that Alexandra could inherit her father’s property and a report of the finding was published in the Ballarat Star of 1 December 1916. 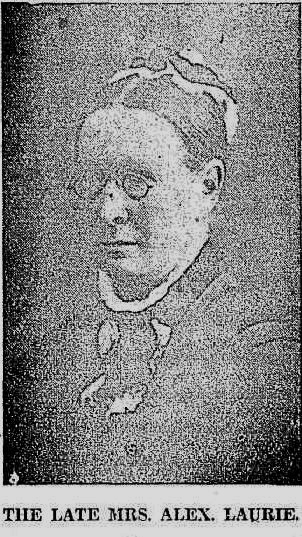 Agnes DOWNING – Died 29 November 1915 at Hamilton. Agnes Downing was born around 1844 at St Edmunds, Suffolk and arrived in Victoria with her parents around 1869. Soon after, they arrived in Hamilton. In 1871, Agnes married butcher James Willet and they had two sons and two daughters. Agnes was living in Skene Street at the time of her death and was buried at the Old Hamilton Cemetery. William CHADDERTON – Died November 1916 at Hamilton. William Chadderton was born at Staffordshire England and arrived in Victoria in 1883. He lived at Buckley Swamp for eight years and during that time married Jane Kirkwood in 1885. William then purchased Glencoe at Bochara where he bred fine Jersey cattle. He was a member of the Hamilton Pastoral and Agriculture Society and won many prizes at shows with his stock and produce. At the time of his death, William left his widow Jane and four sons and two daughters. He was buried at the Old Hamilton Cemetery. Jane COBB – Died 4 November 1917 at Lower Crawford. Jane Cobb was born in Dorset, England around 1833. 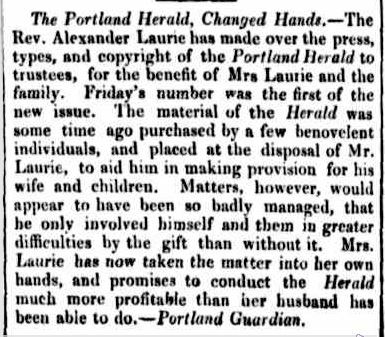 She married James Hiscock and they travelled to Australia on the Shand arriving at Portland at Christmas 1854. They first went to Grassdale but soon moved to the Lower Crawford district, living at their property The Elms for the rest of their lives. James died in 1900. Jane had two daughters at the time of her death. Walter Thomas HENTY – 25 November 1917 at Hamilton. Walter Henty was born in 1856 at Portland a son of Stephen George Henty and Jane Pace. 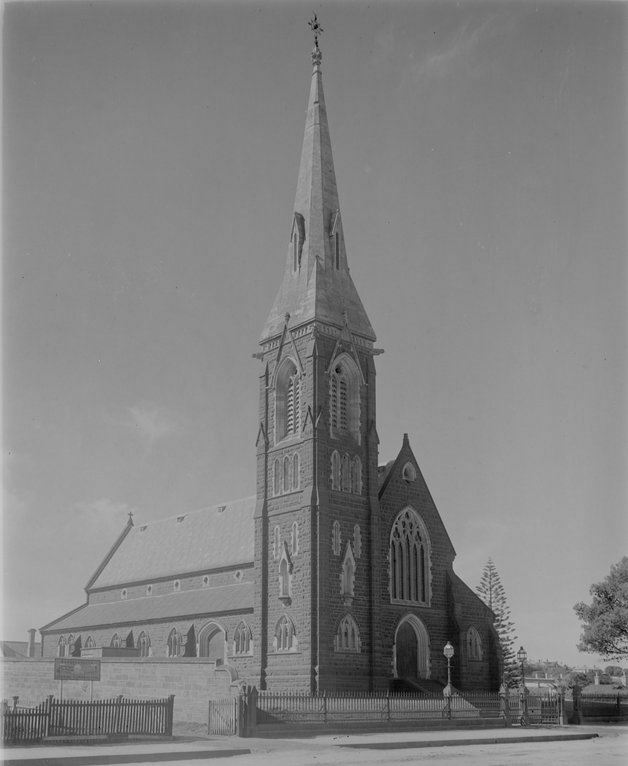 On 27 November 1881, Walter married Annie Margaret Campbell at St Stephen’s Church, Portland (below). They spent their honeymoon at nearby Bridgewater. Three sons were born to Annie and Walter, Wilfred in 1883 at Hamilton, Archie in 1884 at Portland and Edward Ellis in 1888 at Portland. 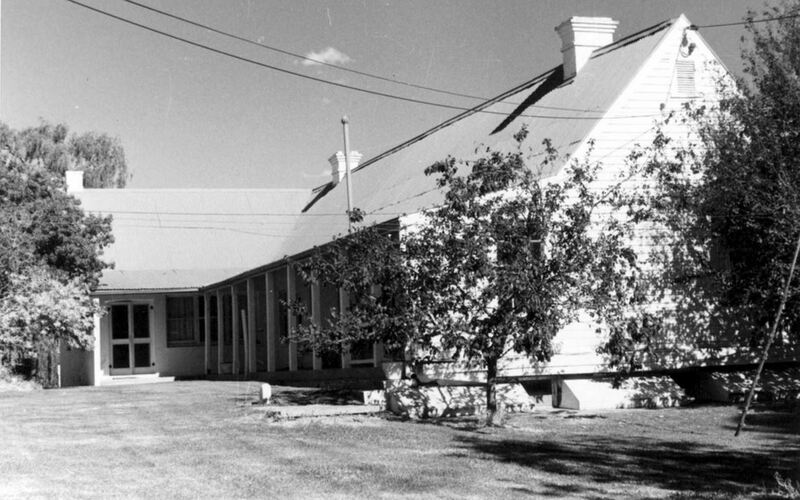 The family moved to The Point at Victoria Valley in the Southern Grampians were Walter farmed. Around 1897, they settled at The Caves, a property on the Grange Burn, very close to William Chadderton (above). Walter Henty led a quiet life, avoiding public life, but was well-known all the same. He was well-liked and “highly respected for his sterling and generous qualities”. Those qualities were also present in his son Edward Henty. Walter’s appears to have been a relatively simple life considering his heritage and the lifestyles of some of his siblings and cousins. He went about his business of farming, with Archie joining him running The Caves and Annie selling chooks (below). “Advertising” Hamilton Spectator (Vic. : 1870 – 1918) 23 October 1911: 5. . 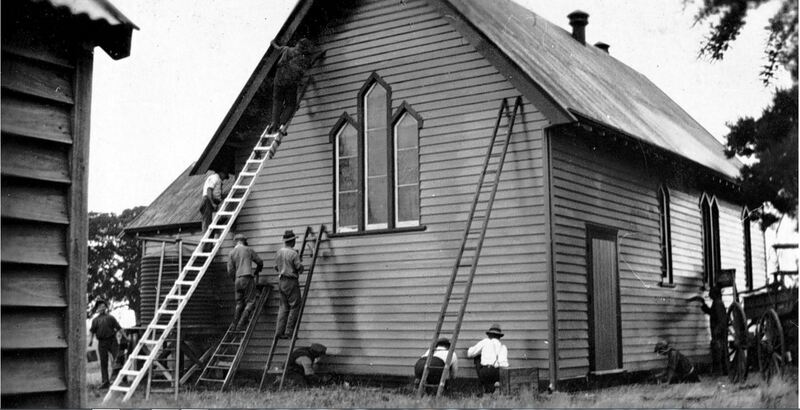 The following photos are from a collection of photos taken by Wilf Henty and held by the State Library of Victoria. I can’t be totally sure but after looking at Wilf’s other photos and comparing photo descriptions, I believe the photos depict Walter and Annie Henty. 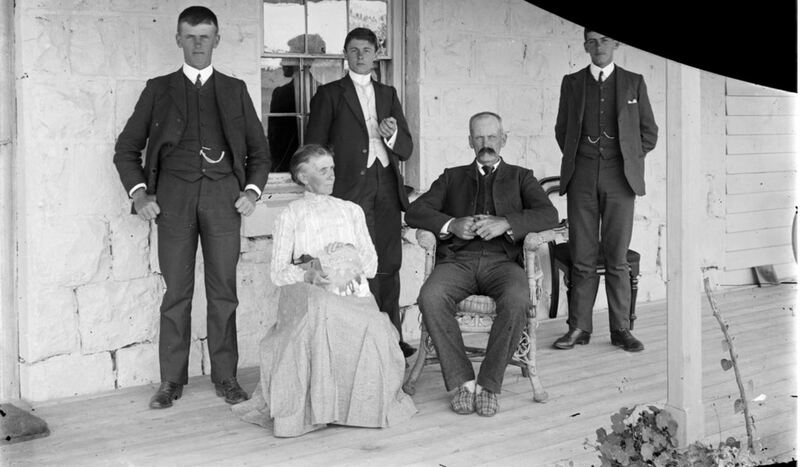 The second photo has three young men and Walter and Annie had three sons close together in age. Having researched Edward Ellis Henty and seen a number of photos of him, I believe Edward is the young man on the right. If so, the second photo would date back to around 1905-1908, when the Henty’s resided at The Caves. 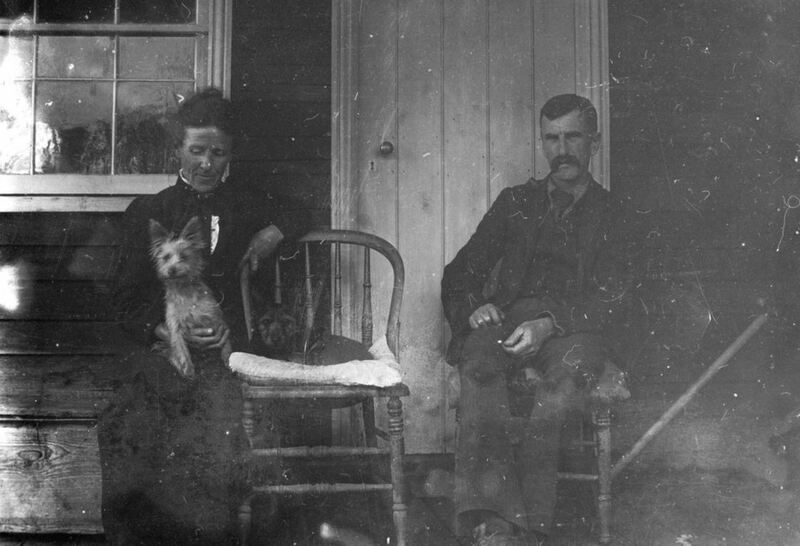 The first photo shows a younger version of the couple but in front of a weatherboard house. 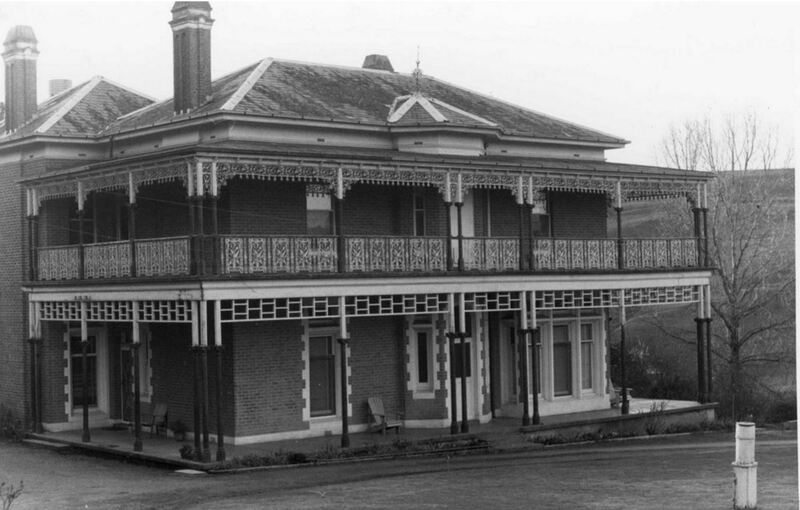 This is possibly the Henty home at The Point, Victoria Valley. In 1914, Walter and Annie attended the wedding of their son Edward on 18 November 1914. Edward was the only one of their three boys to marry and it was a large social event for Hamilton but bittersweet for Walter and Annie. Lieutenant Edward Ellis Henty of the 8th Light Horse Regiment was on leave from camp at Broadmeadows. Home to marry his sweetheart Florence Pearson. Edward left for Egypt in February 1915 and by May 1915 was off to Gallipoli. Lieutenant Edward Henty was killed during the Charge at the Nek on 7 August 1915, standing little chance. By then Florence was six months pregnant and living at The Caves with Walter and Annie. Walter and Annie’s only grandchild, Edward Henty Jr was born on 21 October 1915. Around the time of Edward’s death, Walter’s health began to falter. A few weeks before his death, he was confined to home. He was just sixty-two. Walter was buried at the Old Hamilton Cemetery. Annie died in 1921 aged sixty-nine. 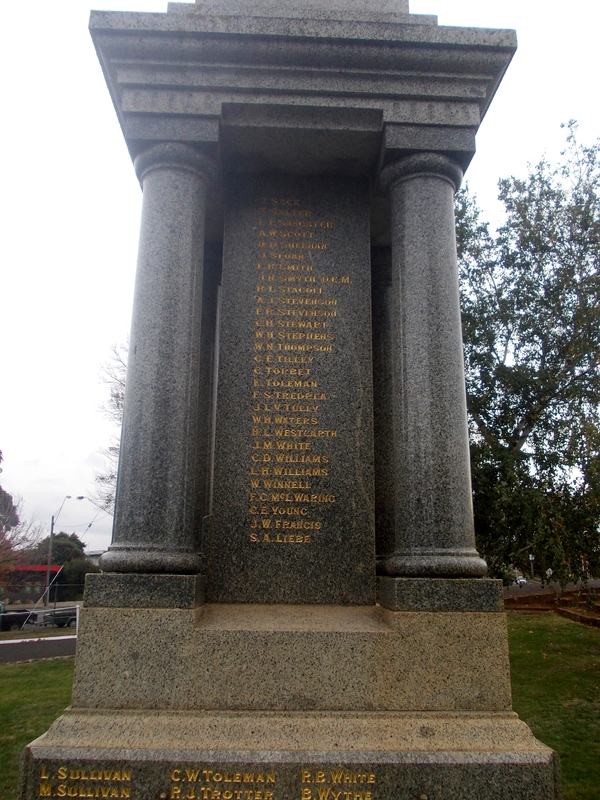 John Joseph SCULLION – Died 13 November 1918 at Terang. 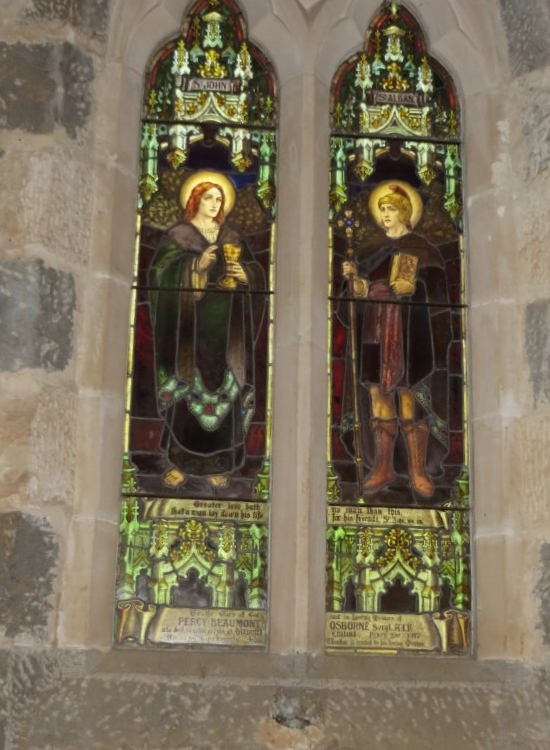 John Scullion was the son of John and Janet Scullion and was born at Dennington in 1866. The Scullions moved to Garvoc settling at Mount View and John was soon helping his father with the property. He succeeded his father as a member of the board of Directors of the Garvoc Butter Factory and was a senior partner in Scullion Bros at Garvoc. He was also on the executive committee of the Garvoc Racing Club. At the time of his death, John’s sister Lilias Scullion was running a private hospital at St Ronan’s Hospital in Hamilton, the former residence of David Laidlaw in the obituaries above. His brother, Daniel Scullion had owned the Caledonian Hotel in Hamilton until 1915, and at the time of John’s death, Daniel’s widow was still operating the hotel. Anne WILLIAMS – Died 17 November 1918 at Colac. Ann Williams was born in Ireland around 1831 and arrived in Victoria in 1849 aboard the Elgin. During the Eureka uprising in 1854, Anne was living at Ballarat. She then lived at Geelong before going to Pomberneit in 1869 with her husband Samuel Lord. Two years prior to her death she moved to Colac. Anne had an interest in the history of Victoria and knew much about the early days. She and Samuel had five sons and three daughters. 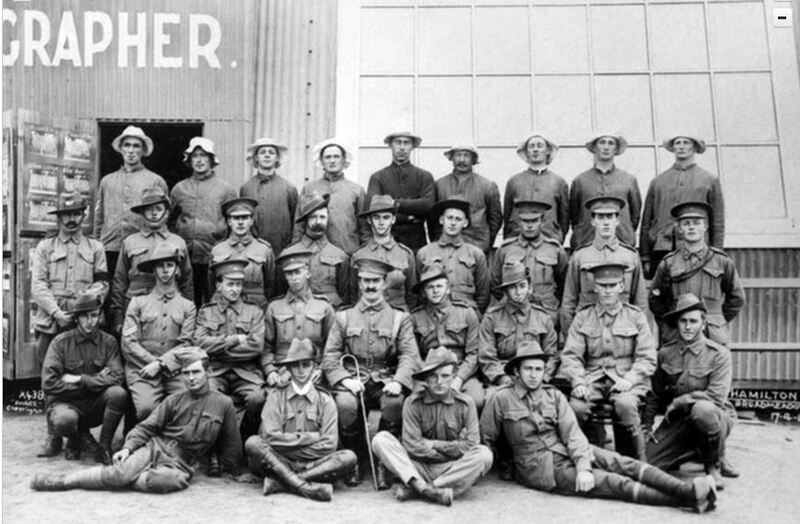 At the time of her death, she had seven grandsons serving with the AIF. One had lost his life and another awarded a Military Medal and Military Cross and recommended for a Victoria Cross. Grace Murray WILLIAMSON – Died 24 November 1918 at Chetwynd. Grace Murray was born at Inverness Scotland in 1823. She married Walter Edgar and they had three children before they left for Australia in 1853. On arrival, they headed for Pine Hills at Harrow where Walter’s brother David resided. Around 1870, the couple went to Tallengower and by 1876 were at Woodacres at Chetwynd where they remained and had a further seven children. Devoted to her family, she ran a true Scottish home with much hospitality shown to a wide circle of friends. Grace never went far from her home at Woodacres and during her time there only visited Casterton three times and Coleraine twice. Walter died in 1896. A stoic Scot, Grace endured the loss of Water and rheumatism she had suffered with for thirty years and in 1908, she broke her thigh. Grace was buried at the Tarrayoukyan Cemetery near Nareen. Eliza Ann OWENS – Died November 1918 at Coleraine. Eliza Owens was born around 1845 at Anglesea, Wales. She arrived in Australia in 1854 aboard the Severn with her parents and younger sister. Also on board was her uncle Richard Lewis who lived at Rifle Downs. He was importing thoroughbred stallion King Alfred, who went on to sire many successful racehorses in the colony. Other passengers included James Edgar and his family, a brother-in-law of Grace Williamson (above). Eliza Owens married William Moodie at Portland in 1866 and they settled at Wando Dale, Nareen (below). Eliza was an organist at the Digby Church of England before her marriage and later at St. David’s Nareen (below). She was well known for growing and exhibiting flowers. In their later years, Eliza and William moved to Mona Vale, Coleraine. At the time of her death, Eliza left twelve sons and daughters including one on active service. They operated the Princess Alexandra Hotel for twenty years, later known as the Grand Central Hotel. 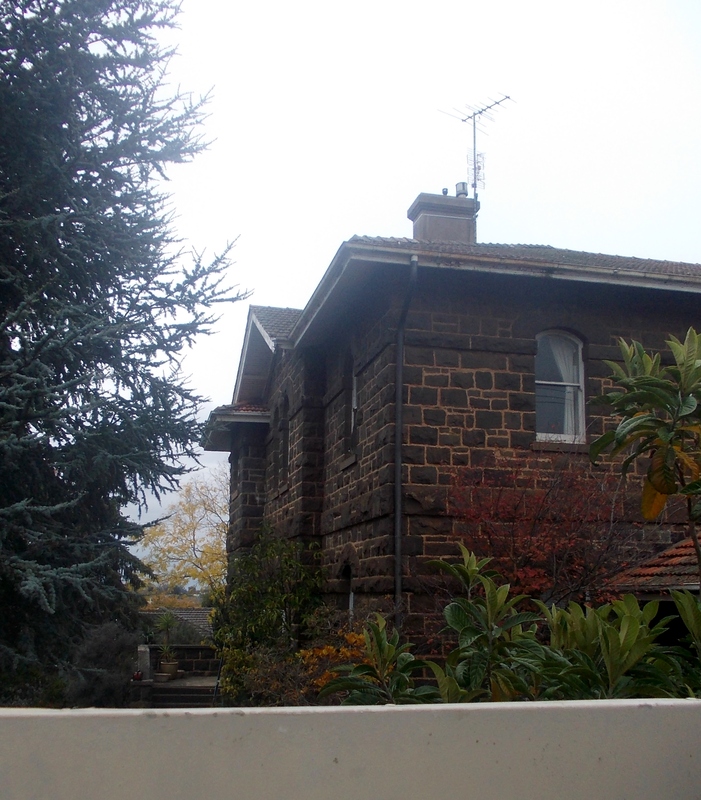 After retirement, they lived in Warrnambool for a few years before moving to Melbourne around 1915. Annie was buried at the Fawkner Cemetery.